James V. “Jim” Garrett, 80, passed away on December 1, 2018 peacefully at his home. He was born on October 27, 1938 in Houston, Texas to parents James Porter and Marie Emma Garrett. He attended Jacinto City Elementary School, Galena Park Junior High, and Galena Park High School. James proudly served his country in the United States Marine Corps from 1956 to 1960. 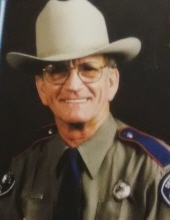 He retired in 2001 from his career as a State Trooper at the Texas Department of Public Safety after 37 years of employment. James is preceded in death by his parents, aunts and uncles, and several cousins. He is lovingly survived by his wife, Lisa (Gibbs) Garrett; sister, Carolyn Tarris; brother, Donald Garrett; two daughters; three grandchildren; four great-grandchildren; as well as several nieces, nephews, extended family members, and many friends. To send flowers or a remembrance gift to the family of James V Garrett, please visit our Tribute Store. "Email Address" would like to share the life celebration of James V Garrett. Click on the "link" to go to share a favorite memory or leave a condolence message for the family.